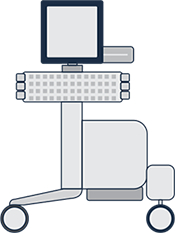 Looking to expand your clinic or upgrade your equipment? Then board the Clix Express to enjoy healthcare equipment finance (loans/lease) that’s are designed just for you. With our easy process and quick approvals, you’ll soon be one step closer to providing world-class healthcare. Be it a loan or a lease, you can choose the cash-flow that works for you. We also take care of finance for the setting up of clinics — so you can focus on the bigger picture while we take care of the details. How do I check my eligibility for a healthcare equipment loan from Clix? What documents do I need to submit with my application for healthcare equipment finance from Clix? How do I avail healthcare finance from Clix? Do I need any collateral to avail the healthcare equipment finance? Nope. We don’t need any additional collaterals or guarantor for your loan in most cases. How can I reach out to Clix for any other information on my loan or lease? Apply for a simple, fast, and accessible healthcare equipment loan or lease from Clix!